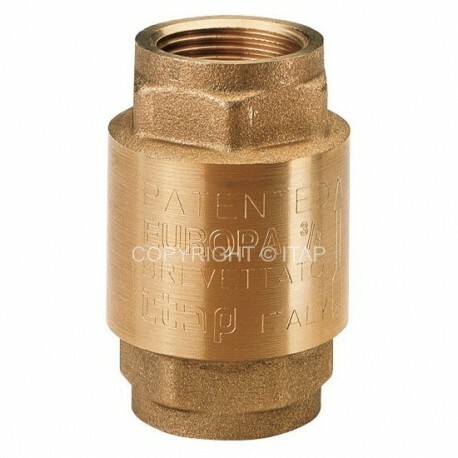 Check valve EUROPA 1/2" (DN 15) is uni-directional; in the sense that valve manage the flow in one direction only, which is indicated by the arrow on the body. Minimum and maximum working temperatures: -20°C, 100°C. Threads: ISO228 (equivalent to DIN EN ISO 228 and BE EN ISO 228). -In case the fluid transported has got some impurities (dust, too hard water, and so on) it’s necessary to remove impurities by or filter them, otherwise they could damage the seal. Verify the valve periodically, according to its application’s field and its works’ field and its work’s conditions, in order to be sure that the valve works correctly. In case of losses of tightening, take note that these can be caused by a deposit of foreign bodies (dirty, calcareous) on the rubber seal. In order to solve this inconvenient, it’s necessary to unmount the valve and remove the foreign body with compressed air tools.